My idea for this quilt came from Cathy Nigrini (see Article: pdf 960kb), a scientist guild member who is studying plankton. She goes on sea/ocean expeditions to take samples and catalogue plankton from around the world and is one of few people in the world who study in this field. One day at her house, she kindly let me see one of her books showing early drawings of plankton (1862). I was particularly taken with the complexity of a single celled entity and the fact they are so small they really never get appreciated for their beauty by most people. This quilt has taken 3 years to complete because I had to learn some of the techniques incorporated into it. This Mediterranean Sea plankton was first described by Ernst Haeckel of Germany in 1860 and revised in 1887. The diameter of the whole jelly sphere is 1-4mm. It is extant (still alive) and because this plankton has no skeleton, we don't know how long they have been around. Although they are yellowish and grey in true appearance, I got carried away by artistic license in choosing the colours for this quilt. The spheres on the right show close-ups of parts of this particular plankton. The top right sphere is the central compact capsule. The next sphere holds the central compact capsule. The third sphere is the nucleus, its surface covered with small roundish finger-like protuberances (beads). From this nucleus, on the complete cell, you will see long thin cylindrical nucleoli extending beyond the cell bubbles (an effect that was achieved using a technique called couching). The fourth sphere on the right shows a close-up of the jelly-body containing the numerous "bubbles". The embroidered patches represent protoplasm. Finally, the beads on the main view of the cell show numerous xanthellae (little cells scattered on the bubbles). Materials: 100% cotton, glass beads, rayon yarn, cotton and rayon thread. Size: 57 3/8" x 60 1/8"
Barbara J. West is a quilt art artist, born and raised in Canada. She displayed her first original quilt in 1998 in Canmore, Alberta, Canada and has not looked back since. 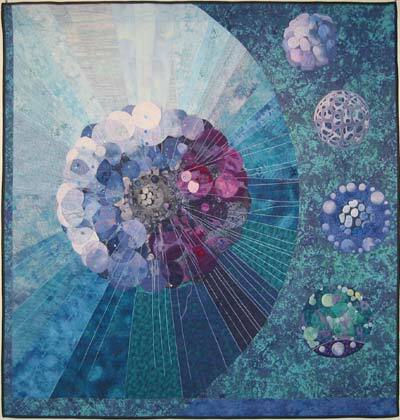 She has been juried into National Shows for several years and recently won National awards for 3 of her art pieces, including First Prize for the large Innovative Quilt Category at the Canadian Quilters Association National Juried Show (2003) for the plankton quilt on this website. 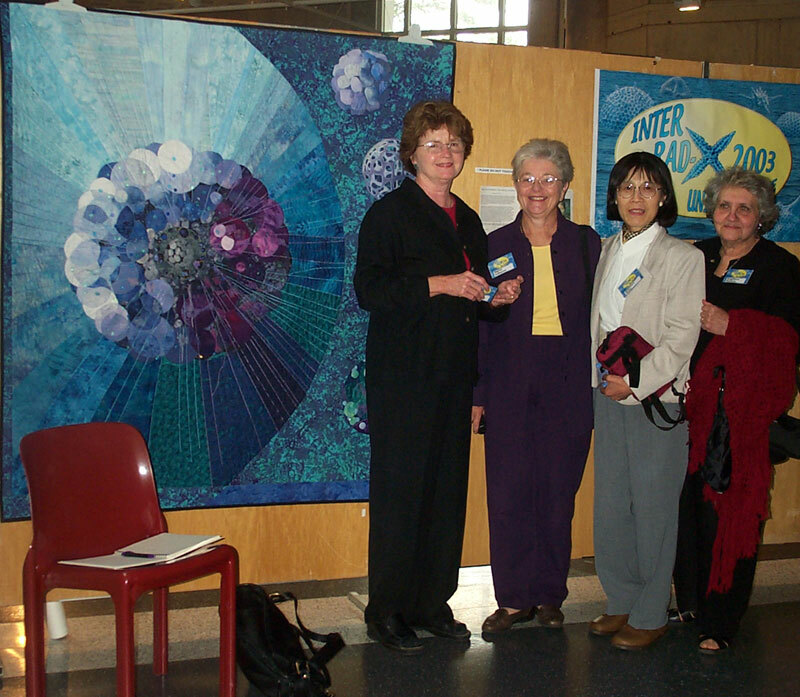 This quilt was selected by the Canadian Quilters Association as one of five quilts representing Canada to be sent to the World Quilt Festival in Nagoya, Japan in March of 2004 as part of their Invitational Show. From left: Patricia Whalen (USA), Catherine Nigrini (Canada), Akiko Nishimura (Japan), Svetlana B. Kruglikova (Russia).